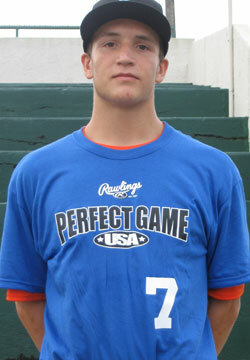 Stephen Vaughan is a 2010 RHP/3B/OF with a 6'1'', 171 lb. frame from Carolina Beach, NC who attends New Hanover HS. Medium athletic build, should get stronger. Simple repeatable pitching mechanics, low 80's fastball, more there with better extension out front, good change up, downer spin on CB. Potential OF prospect, very strong arm, plus defensive fundamentals, has some bat speed/hitting skills. Good follow.